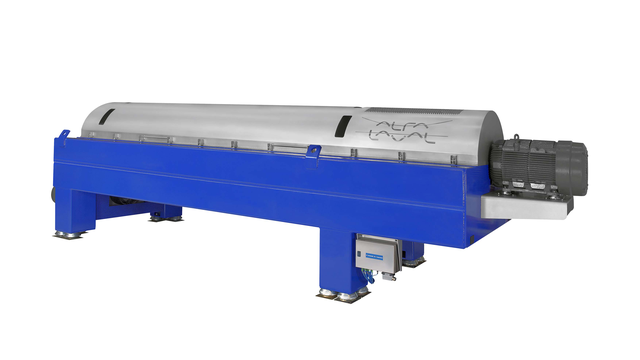 Alfa Laval LYNX decanter centrifuge is a key component in solids control systems of drilling rigs and other oil and gas processes such as barite recovery, oily water, and slop oil treatment. It is specially designed for heavy-duty jobs and high recovery at large feed flows. Alfa Laval LYNX drilling mud decanter centrifuges are designed specifically to remove unwanted solids and fine particles from virtually all kinds of used drilling mud, including those based on water/synthetics and conventional oil-based drilling fluids. Built for heavy-duty processing, a LYNX installation handles large quantities of solids in the feed flow, as well as being able to cope with coarse, abrasive particles. It also efficiently removes the vast majority of fine particles, down to sizes of around 5 microns. Traditional equipment is unable to deal with these particles, which have a serious impact on the quality of drilling mud because of their abrasive effect. The Alfa Laval LYNX decanters have been designed for the best available wear protection in the market. A LYNX installation can pave the way to dramatic reductions in drilling mud costs because less mud is wasted. Being able to remove solids in very dry form also means lower costs for transporting and disposing of solids waste. Additional savings stem from opportunities for automatic, unattended operation, and from the extended service life of LYNX installations due to their exceptional reliability. 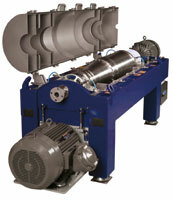 The machines have been designed for reduced prower consumption in relation with process flow. Optional modules are available to match LYNX set-ups to specific needs encountered on drilling rigs. These include both fully automated modules and relatively simple manually operated modules that together provide cost-effective solutions to all solids separation requirements. Alfa Laval LYNX drilling mud decanter centrifuge is built around a slender cylindrical bowl with a relatively large length/diameter ratio and a conical end. This bowl rotates at speeds of up to 3650 rpm (according to model), producing centrifugal force of anywhere from 300 to 3574 G. The other key components include a main drive motor, heavy-duty gearbox, back drive motor and control panel. The Alfa Laval direct drive gearbox ensures automatic control of the conveying speed. The liquid drilling mud is fed into this long cylindrical bowl, where the centrifugal force presses it outwards to form a layer – known as the pond – around the wall. The thickness of this layer is determined by a series of discharge weirs at the end of the cylindrical section. The clarified liquid flows out over these weirs, with the aid of centrifugal force. Since the solids in the mud are heavier, they remain plastered against the bowl wall, and are continuously removed by the screw conveyor. They are then transported up to the conical section (known as the beach) where they exit via the discharge ports at the narrow end. Cleaned drilling mud exits at the opposite end.